Garbage / Linen Chute is our flagship product. A high degree of quality control is exercised right from the selection of individual components to the assembly of the completed system. Such attention to detail and our continuous, innovative research make us favourable to developers, Municipalities and Civil Defence in the UAE. Ostermeier is an approved supplier recognized by all consultants locally and regionally. Around 70% of the UAE's prestigious buildings are equipped with our systems. Burj Khalifa -the world's tallest building - is one of them. Garbage Chutes & Linen Chutes are made in Stainless Steel AISI 304/316 Grade. The telescopic joining system provides easy installation of the chute tubes. Clamp rings are fitted around the joint to give additional strength. 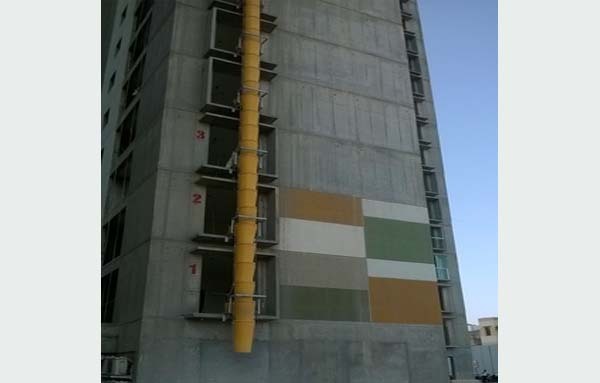 All chute tubes are coated with high quality sound dampening paint to suppress noise during garbage fall. Intake tubes at each floors are fitted with stainless steel bottom hinged intake doors with indicator bulbs. The doors are interlocked (optional) to restrict the simultaneous opening at different floors. The interlocked doors are connected to an electrical control panel. The heavy duty chute offset tube fitted at the bottom end, reduces the freefall impact of the garbage. Linen chutes with intake doors are installed in hotels to give easy access to the laundry room. The linen chute tubes have a smooth interior surface to allow free fall of the soiled fabrics without any damage and obstructions. 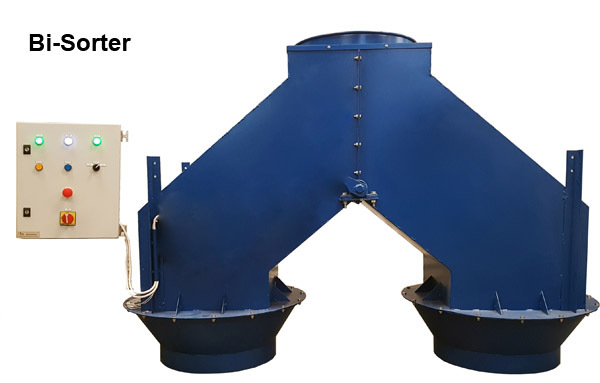 Debris Chute System comprises of HDPE hopper tubes and straight type tubes with galvanized supporting frame. Compared to conventional steel drums, HDPE debris chutes help reduce noise level at construction sites. They help to remove unwanted material immediately and thereby reduce obstruction in the work area. Telescopic sections allow easy and quick installation. Intake hoppers are installed at intermediate floors to give easy access to the chute. Hydraulic Compactors are suitable to take high volumes of garbage. 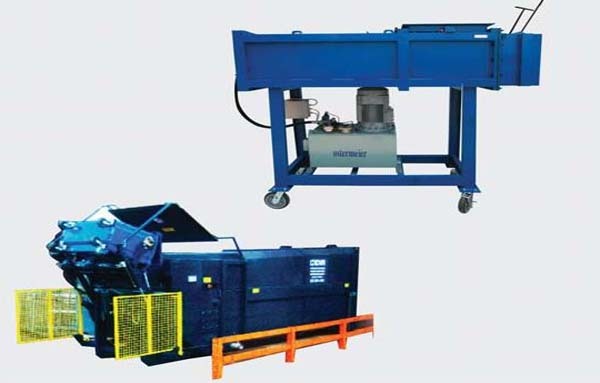 Garbage bags are directed to the compactor through a hopper and its volume is reduced using a hydraulic operated ram. The compacted garbage is then pushed to garbage trolleys. Using compactors will reduce cost of garbage disposal. Ostermeier hydraulic compactors are available in top loaded and bottom loaded designs fitted with heavy duty castor wheels. The high quality hydraulic system ensures smooth trouble free operations and is equipped with electrical overload cut-off protection circuits. 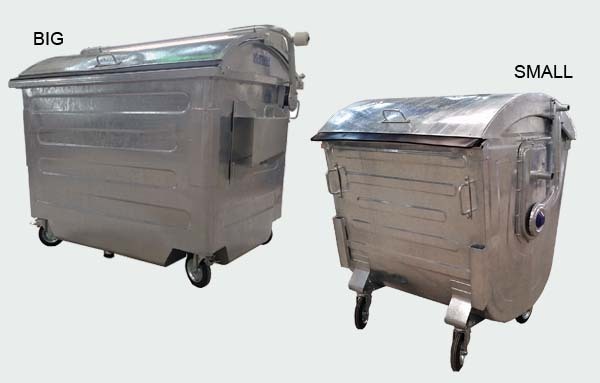 High quality galvanized steel Garbage Trolleys are available in sizes 1.1, 2.5 & 4.5 cubic metre capacity. These are designed to be used with vehicles equipped with waste compact-collector units. Trolleys have easy to operate hinged lids and are fitted with heavy duty castor wheels. 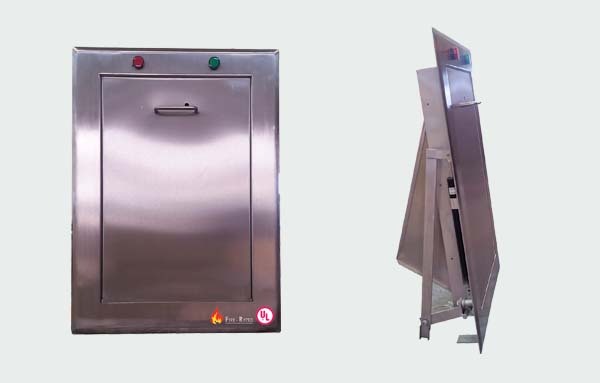 The main electrical Control Panels are indigenously designed at our well equipped factory to meet the specific requirements of each garbage chute system. Control panels are made of high quality components in accordance with industrial quality standards. 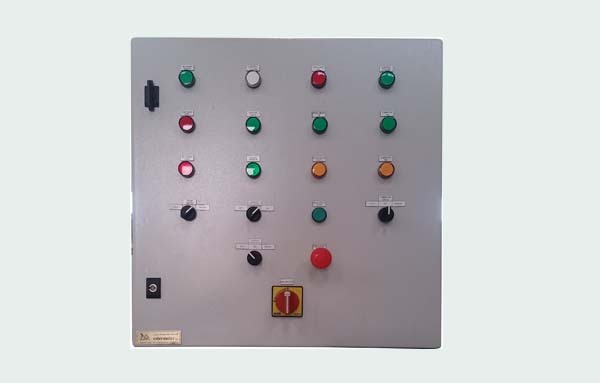 The control panels consist of main isolator switches, indicating lamps and controls for activating functions such as cleaning cycle, exhaust fan and intake doors. 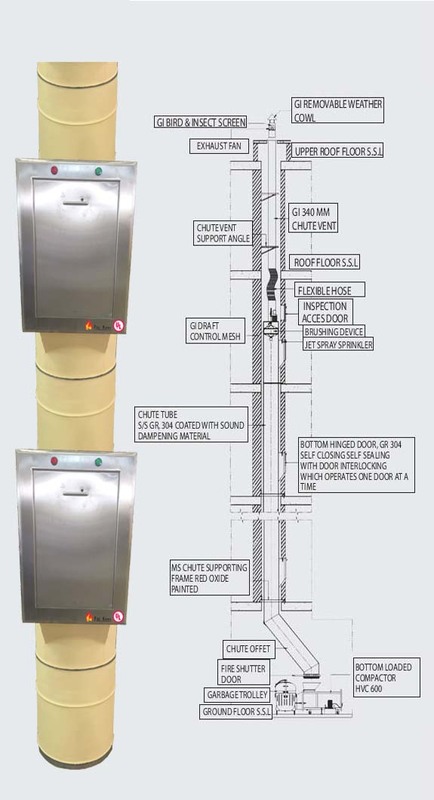 The Stainless Steel Intake Doors are located at every floor for easy access to dispose garbage bags. Doors are hinged at the bottom and equipped with gas springs to make them self closing. Doors have self-sealing and self-locking electromagnetic interlocking mechanisms which allow opening of only one door at a time and lock all doors during cleaning and maintenance. Pilot lamps are provided on each intake door which indicate the door status (locked or unlocked). Underwriters Laboratories Inc. certified 1 hour fire rated doors are also available to meet customer specifications.